Minecraft may be king of video games for Generation Z, but that doesn’t mean your kids won’t love crushing you at Pac-Man. Luckily for us Gen X and Millennial parents, the arcade (old-school AND nuveau) is alive and well in Austin, and a great place to head on a rainy or super-hot afternoon. For a true 1980s arcade experience, you can’t really beat Pinballz. Put your dollars in the token machine, and spend a few hours reliving your middle school days playing Tron, Pac-Man, Skee-ball, Dig Dug, or one of literally hundreds of other video games or pinball machines. Your kids will love playing the games as well as trading in tickets for useless but fun prizes at the end of the afternoon. In addition to laser tag shoot-out fun, Blazer Tag has an arcade with more than 50 games ranging from Pac-man to Guitar Hero. Load up your FunCard and hit the games up in this large arcade located in between Pflugerville and Round Rock. There's also bowling, Go-Karts, batting cages and more should the kids need a break from too many rounds of Asteroids. Located in east Austin, this City of Austin-owned family/youth/event center has arcade games, bowling, skating and a food court. Note: Open Wednesday through Saturday only. In addition to lake views, a playground, good food and craft beer, Ski Shores serves up a small but solid game room that includes Galaga, foosball and air hockey. Part bowling alley, part laser tag, and part arcade, this fun center in Pflugerville has a little something for everyone. A bit on the smaller side, the arcade features new games as well as old-school classics with cards that keep track of points that can be redeemed for prizes. If you’re looking for the superstore of kidtainment, Main Event is probably it. 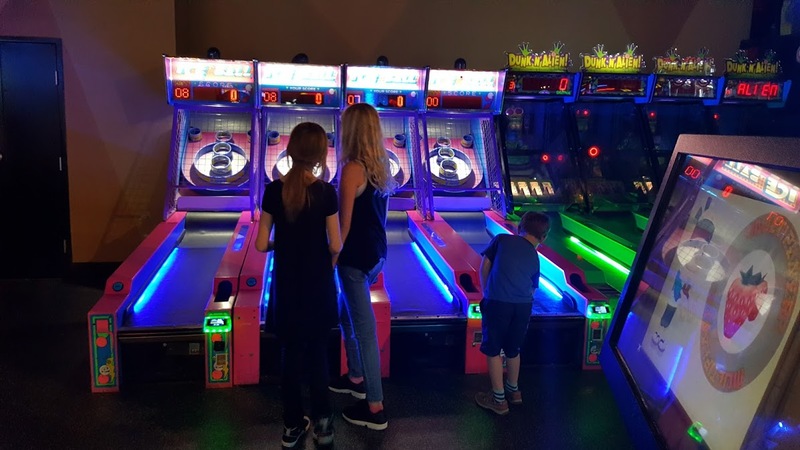 In addition to spending time in an arcade, you can bowl, rock climb, play laser tag, eat pizza, mini golf and engage in lots of other activities. Makes me tired just thinking about it. High Five is a scaled-down version of Main Event with laser tag, video games, bowling and food. As a bonus, it’s still new enough that it feels squeaky clean and sparkly. A perennial favorite for kids, Gattitown is that ace in the hole you can pull out on a day when tempers are short and no one can agree on what to do.